I’ve been thinking a lot about automation recently. One of the big questions that I ask myself over and over is, what can I stop spending so much time on? What are things that I’m not great at that could get better through automation? I have a list of general things that I think would be fun to try automating (which I’ll write about later), but of the list of tools, I think that wearables present an interesting opportunity for automation. The problem is, that I am having trouble thinking of what I could do there. People said similar things about mobile internet devices (Smartphones, old Windows Phones, PDAs, Nokia Internet Tablets) to what some are now saying about Glass. Back before the iPhone, and really for several years after Android’s introduction, people kept asking why they needed to be able to check their email when they were away from their desk, as if that’s all a smartphone was good for. There was a niche market for this that BlackBerry did a great job of serving. This viewpoint is incredibly myopic, and I am of the opinion that it is a similarly myopic view of smart wearable devices. For smartphones, there was a game changer (actually probably a few, but I’ll focus on one) that came into play that took the smartphone from a ‘nice to have’ to a necessity, and that was real time navigation. Real time navigation was a very clear example of a use case that strongly favored the smartphone over existing technology, and it was something that more and more people were becoming interested in. More and more people were starting to buy dedicated GPS devices at price-points between $200-$500. This device did one, and only one thing, and it did it in a relatively fixed and frustrating way. Android came out with Google Maps, as well as several other low-cost real time navigation apps with different feature sets, at a price-point of under $200, and it did a lot of other really great stuff. What’s more, the navigation experience was sure to improve over time, whereas the dedicated unit would require expensive map updates, and eventual replacement. There were also features that were very difficult for the dedicated units to do, like real-time traffic updates. Other killer smartphone features are over-the-top calling and messaging, which can provide a much better experience than those provided by the phone companies. At this point, it’s a low-cost full-fledged computing platform. You can even write Android apps from your Android phone (not that I have any idea why someone would want to do that). Email on the go is nice, as is checking the web. And, there are tons of other really incredible mobile experiences that don’t make sense on PCs or other platforms. Now, back to wearables. Is it possible that it’s just a bit too early to be discounting several totally novel ways of interacting with smart devices? Is it possible that there may be some applications that once released would be market drivers, and really sell the notion of smart wearables to the masses? Do you think that there’s a possibility that whoever figures out what that product is will become a huge player, worth billions of dollars? Do you still want to ignore this still untapped market? I know that I don’t want to miss what’s next. And, to be sure, I think that’s going to come from some currently unknown (or barely known) developer, who really hits it out of the park. So yes, it may be early in the game, even too early for some, but if you want to get a head start, now’s the time to start running. I saw the news today about WhatsApp releasing a beta version of their app with Android Wear support. It got me thinking about what makes for a good experience, especially on wearables. This is something that I do think about quite a bit, but I haven’t written a lot about. One thing that popped into my head was that my co-worker and I had solved some of the same problems on our app, Talkray, that WhatsApp is trying to address. While I don’t have much insight into WhatsApp’s design process, I can talk a bit about what we looked at when we were working on Talkray’s Android Wear support. I actually presented on this last week, here’s a video of that. If you haven’t heard of us before, Talkray is a calling and messaging app. Talkray has had Android Wear support since Wear launched. There were two basic things that we wanted to be able to do from the watch. First, was to be able to answer incoming calls. The other thing was to be able to quickly respond to incoming messages. We came up with two basic ways of responding to messages, a canned auto reply and a voice reply. 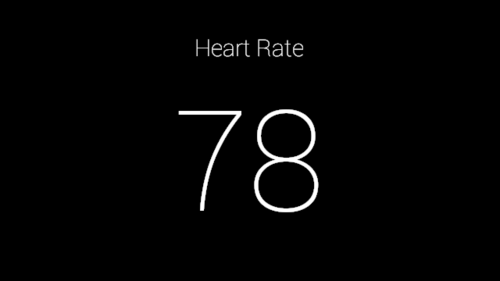 We took into account a few basic considerations when designing the UX for our wearable app. First and foremost, we wanted to have very, very quick interactions, as short and simple as possible. There’s a 5-second rule that shows up in Google’s documentation for Android Wear, and that is that if you force the user to interact with you on a watch for more than five seconds, they might as well have pulled out their phone. There were several other things that we thought about too, like the fact that Wear is going to be a small screen, with limited interaction capabilities. We didn’t want to make the user read or think, as much as possible. We also wanted to make it safer to use while driving, since we know that people do text and drive, even though they shouldn’t. I realize that it’s a bit controversial to say that, but I felt that if we could cut down the interaction enough, we could give people something that would allow them to quickly and easily respond to messages without pulling their attention away from the task at hand. The first thing that we give users is a button to send a canned response to a message. This is actually a bit interesting in that it uses Activity Recognition to figure out what you’re doing and respond intelligently. E.g., if you’re driving, it will say that you’re driving and can’t talk right now. We considered giving multiple choices for canned responses, but felt that doing so would require too much interaction, and would defeat the purpose. There’s literally only one thing to do here if you want to send a canned response. No thinking, just hit the button and you’re done. For anything beyond the canned response, we figured that people should be able to say what they want. However, after a year of using Glass, I know that when I see the speech to text running, it distracts me from just saying what I want to say, and I start thinking about what I’m reading. This is really bad for two reasons, first, it pulls my attention into the watch. Second, it distracts me from delivering the information that I want to get across. Providing a voice-only message, that records the actual audio and sends that, means that I don’t need to think about what the machine thinks that I’m saying, the other person should be able to hear it and figure out what I’m saying based on the audio. The one big down-side to this is that the current crop of watches don’t have speakers. This means that while we are encouraging people to send audio messages, they won’t be able to receive them. While not ideal, we felt that this was acceptable, though there may be room for improvement here. 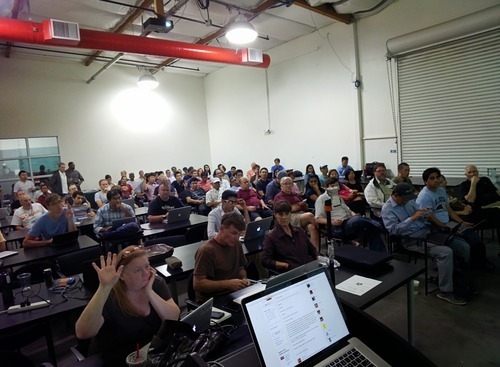 Last, night, I gave a talk on the Android Wear SDK at Hacker Dojo. 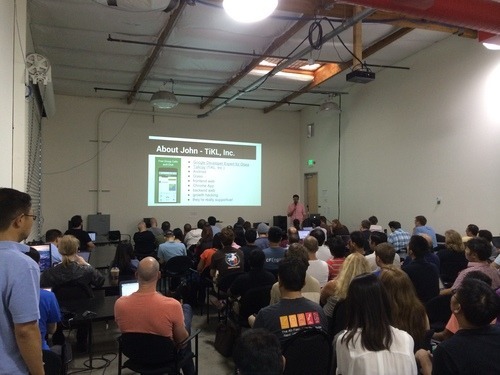 It was listed in a couple meetup groups, and we had about a hundred people show up for the event! The large event room in the Dojo was packed! The main focus of the talk was on UX and data syncing between the phone and the watch. Thanks for all those who came out, it was a lot of fun! Here’s a bonus photo that I found on the meetup page. Thanks to whoever posted it! 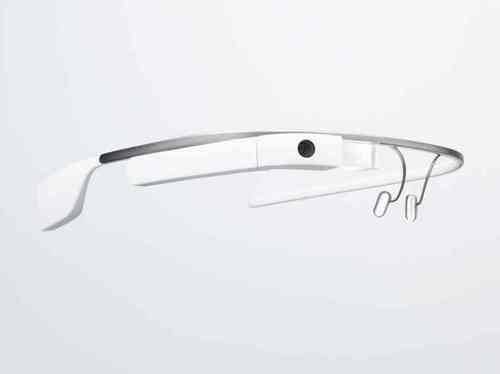 This is the ninth of a series of posts discussing how to get Google Glass Mirror (Java) and GDK projects set up in various IDEs. One of the most common questions that I get from people during workshops is how to get set up either the Mirror quick start, or the GDK project into Eclipse, Android Studio or IntelliJ. This post will cover importing a GDK project into Eclipse. Make sure that all your source is selected. Then ‘Finish’ and you’ll be done with that. Right click the project, select Properties. 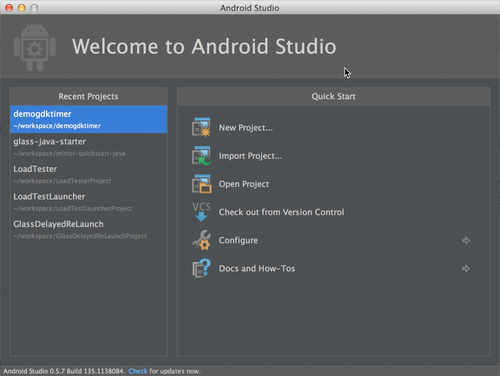 In Project Properties, go to Android, then select the correct SDK. This is the eighth of a series of posts discussing how to get Google Glass Mirror (Java) and GDK projects set up in various IDEs. 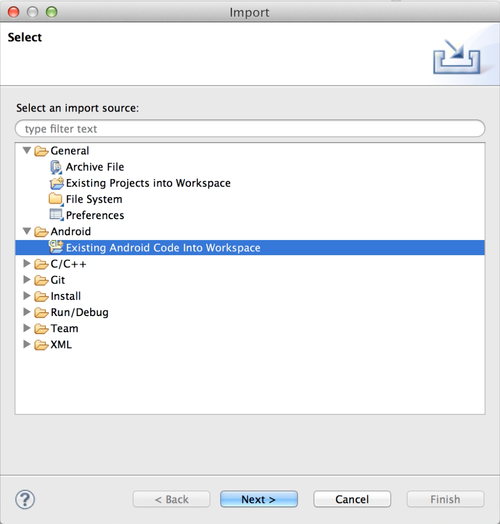 This post will cover importing the Java Mirror Quick Start project into Eclipse. Then 'Finish’ and you’ll be done with that. I previously made a video with instructions on this. Google has also posted instructions for getting OAuth set up. This is the seventh of a series of posts discussing how to get Google Glass Mirror (Java) and GDK projects set up in various IDEs. 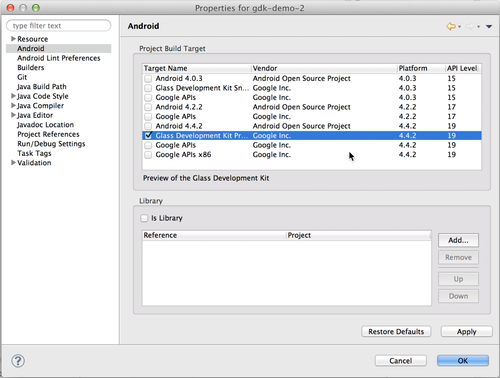 This post will cover importing a Legacy GDK project into Android Studio. Until the project is imported. The project will automatically be converted into a Gradle project. 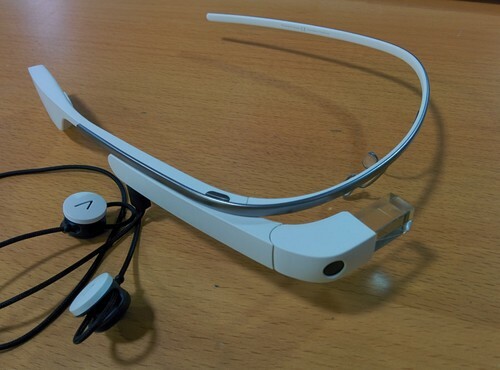 compileSdkVersion "Google Inc.:Glass Development Kit Preview:19"
Need to have one Activity that is considered the launch Activity, otherwise IntelliJ (Android Studio) won’t let you run.